Kev wasn't there tonight, but RGA Bucks has plenty of other excellent instructors: there were two examples providing fantastic technique tonight, Sahid and Dan. 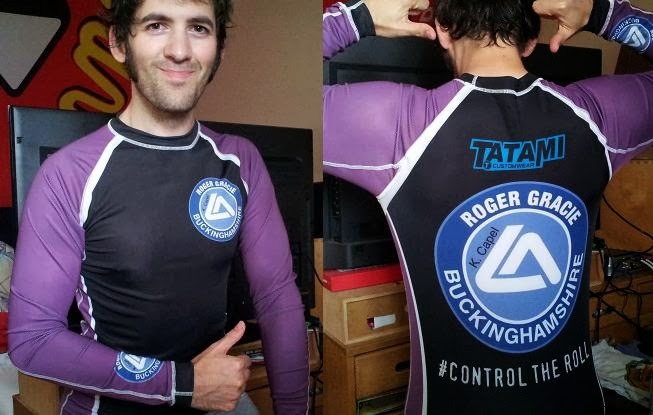 Both of them recently returned from a BJJ camp were Roger Gracie in Spain recently, meaning their jiu jitsu power supplies were primed and ready. It was all armbars from closed guard today, a submission I've never really gotten to grips with, both literally and figuratively. I tend to go for chokes rather than armbars, because I always feel that I leave too much space when I try to armbar and therefore risk losing position. RGA Bucks to the rescue, as the armbars Sahid and Dan showed were super-tight. Sahid was up first, dividing his armbar sequence into three sections. First up, the legs. You're in closed guard. For the purposes of this drill (this could work nicely as a warm-up too), they are going to help you by putting their elbow on the opposite side of your belt knot. Bring your leg on the same side as that arm up, so you can pin your knee against their shoulder. Your other leg kicks up into their armpit. Use that to turn your own body, also bringing their body down with the armpit leg. You can now bring your first leg over their head, keeping your heels pointing down (don't cross your legs). The third and final stage adds in a collar grip with your free hand. Reach for their collar after you've pinned their arm, then pull them down. You can also use the elbow of that collar gripping arm to block the elbow of their trapped arm. That prevents them from trying to bring the elbow of their trapped arm to your other side hip, as that would scupper your armbar attempt. Dan took over for the second armbar variation, which has some similarities but does not build off reaching across the body and pulling their elbow across. Instead, it starts with a grip break, as they've grasped your collar in the standard guard passing position. This is the classic two-on-one grip break where you grab their sleeve on top with one hand, then reach underneath their arm and grab your own wrist. You need to make sure that your grabbing the sleeve with the opposite side arm. A handy tip Dan added for the grip break is to roll your wrists as high up their arm as you can before punching upwards to break the grip. Maintain your hold on the sleeve, then pull your elbow back. Rather than bringing it to your side, get your elbow high by your head, as far back as you can. This strangely makes the hold harder to break: you can test that out by getting your partner to try pulling their arm back when you have your elbow by your side and when it is up high past your head. That makes me wonder if that would work in other situations, like when holding a lasso spider guard. Grab their collar with your free hand, doing a small shrimp in the direction of their trapped arm side to get a better angle. then use the high elbow as base to come up and get an even deeper grip. When you move back down, you can use that motion to get gravity on your side to help break their posture. My training partner had a detail on this, as he likes to drive his knuckles into their neck when you have that grip: I probably wouldn't use that personally, but it is definitely effective. I could feel a choke starting to come on during drilling! Relock your guard up over their shoulder on the trapped arm side, almost as if you're doing a triangle. Push their head away with your gripping hand, then bring your leg over their head. Angle that leg away slightly (so it is a line across the back of their head), to make it harder for them to drive into you, like on Adam Adshead's DVD from a couple of years ago. Sparring started off with me getting stuck under side control. I was trying to stay tight, move around a make space, but didn't pay enough attention to his arm reaching underneath. Too late, I realised he was setting up a baseball bat choke. I attempted to defend by spinning and underhooking his leg, but he already had that in tight for the submission. Good reminder to watch their arms! In my next roll I had a go at getting some of the armbar set-ups but couldn't isolate the arm properly. I also tried practicing a principle from Beyond Technique, which I'm reviewing at the moment. It's the most useful one I've seen so far on the DVD, related to sweeps, but I didn't have too much luck. The idea is to have post, posture and leverage: I think I keep missing leverage. In keeping with previous visits to my parents, they took me down to London right after I got back and showered from training. I started off by heading with my father to the Tate Britain, to take a look at the exhibition on Turner's late works. As I've mentioned before on here, my tastes in art are fairly narrow: there isn't a lot I enjoy outside of 1400-1700. I'm therefore not a fan of Turner's work, especially as he is best known for his landscape painting and veering towards impressionism and even abstraction in some of his later stuff. If it isn't figurative, then I'm unlikely to be a fan, though I'm nevertheless interested in learning more about it. I think it's important to understand why you don't like something, rather than just dismissing it out of hand, and of course keeping an open mind can turn apathy into appreciation. So, I was still looking forward to checking it out. I'll watch documentaries on anything (from shipping containers to heavy metal to German Romanticism), whether I'm a big fan or not. Tickets are £16.50, while the audio guide is about £3.50. That's well worth it, as the guide is well presented and packed with enlightening information. Considering that I'm not keen on Turner, I especially enjoyed the context provided by the commentary , both about Turner's life, his environment and his style. Best of all, it got into the nitty-gritty of exactly how he worked. There are six rooms of Turner's paintings (including other bits and pieces, like his glasses and sketch books), of which the audio guide covers 22, IIRC. I whizzed round the exhibition, only really looking at the paintings covered by the guide, so it took about an hour and a half. Normally, I would have spent at least twice that looking intently at every painting, but that's when it's something I particularly relish (e.g., the 16th century German art at 'Strange Beauty' back in March). You could probably spend a good two or three hours if you wanted to, though I'd avoid Saturdays if you can as that's going to be more crowded.